This quote is the very definition of Captain Janeway. As the first female captain to anchor a television show, Janeway bought a different viewpoint to the captain’s chair. When we first meet Janeway she is leading a mission to track down a Marquis ship in the Badlands near Deep Space 9. After both ships are brought to the Delta quadrant by the Caretaker, the crews are stranded there by Janeway’s decision to protect the Ocampa over the assured return of her crew. After consolidating the crews, Janeway pools their resources and takes on new members in order to keep her promises her to return the ship home to the Alpha quadrant. This willingness is highlighted in “Counterpoint.” Voyager helps a telepathic species cross Devore Emporium. With no immediate benefit helping her new found friends and with the real threat of having her ship confiscated and her crew imprisoned, Janeway is ready to antagonize a xenophobic species. We can only guess that she is only motivated by her sense of justice. Her impersonal skills are on display in “The Void.” Voyager becomes trapped in a starless void with countless other ships. The emptiness has turned some into ruthless pirates but Janeway begins to build alliances with various species in order to find the most effective way to escape. Outside of Captain Sisko, Janeway is the only captain to consistently show a nurturing side. Sisko paternal instincts were a natural fit given he raised a young son by himself. While Janeway had no children, she was able to nurture various members of her crew (B’Elanna and Seven of Nine are prime examples) during their seven years together. 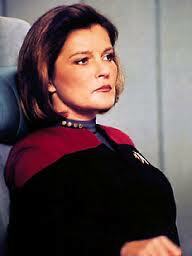 While not the first female captain in Star Trek, Janeway is definitely one of the most interesting. This entry was posted in Musings and tagged Kate Mulgrew, Kathryn Janeway, Star Trek, Voyager, Women in Sci Fi. Bookmark the permalink.